Wainscotting is the process of adding wood paneling to a room. Today, we’re going to talk about the reasons homeowners add wainscoting and whether it might be right for your home. The term 'wainscot' describes both the paneling and the process of putting the paneling on the walls. Initially, it was used as a form of insulation and made from oak. Usually, a dado rail, or chair rail, is added if the wainscoting comprises only the lower third of the room. Wainscoting should never split a wall in half, but should generally be done in thirds. Notice the non-traditional structure of this wainscoting. Bare walls are boring. The fact is, some walls don’t need to be interesting, but many walls will benefit from elements of interest, and wainscotting is perfect. It creates elegance and style without the need for other features such as paintings or even furniture. Wainscotting is lining the interior walls of a structure, usually with wood. Wood is a way to bring the world indoors. It can be comprised of a third of wall, two-thirds of a wall, or even the entire wall covered in paneling. It is usually one level, but at an angle to match stairs or different heights around bathroom elements can make it very playful. Wainscoting represents numerous styles. Raised panel, recessed panel, flat panel, along with textures and touches for every palate. Beadboard is also considered to be a type of wainscoting. More on that below. Most people think of wainscotting as a white-only option. However, sometimes a color will be used. There are stain-grade varieties of wainscotting which can be transformed to any color the homeowner desires. For a dramatic contrast, paint the beadboard and wall two different colors. For natural elegance, paint them the same or close to the same color. While some rooms lend themselves to all around wainscoting, others benefit from having one wall created into an accent wall with wainscotting. The result generally covers all or most of the wall. It can be part of a whole-room look or be a unique element. 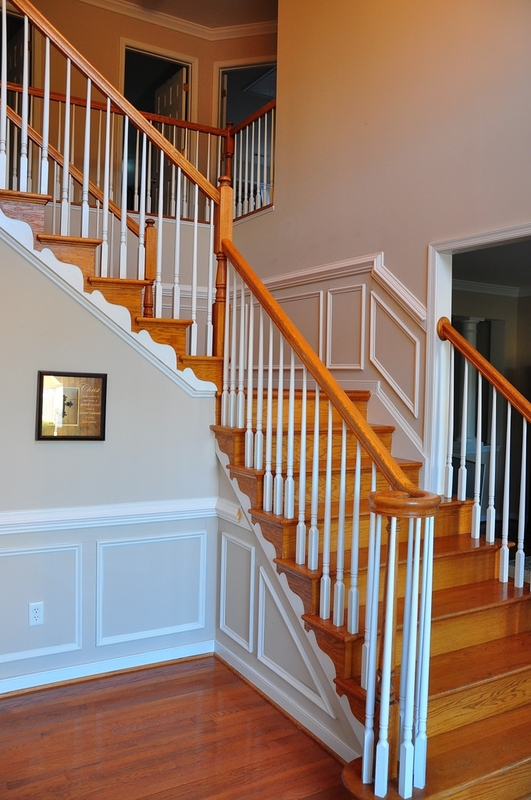 By following the stairs, this wainscoting is both elegance and playful. Wainscoting in a kitchen or bath is often beadboard, a row of narrow boards with a small indentation known as a ridge. Beadboard is almost always lined vertically on the wall and can provide a moisture deterrent. Frequently used bathrooms are perfect candidates for beadboard. Beadboard in the kitchen or bath is often extended to pantries, cupboards, and shelves. Shutters and doors can also be paneled with wainscotting. While it is a much more intense project, it vastly suits some situations. Wainscoting is not for every home but can create timeless elegance and freshness in many applications. It deters moisture and provides additional insulation. Wainscotting on the ceiling creates an extra wow factor.